In August 1995 Portsmouth held one of the last ever Mast Manning displays at the VJ Day Commemorations on Southsea Common. 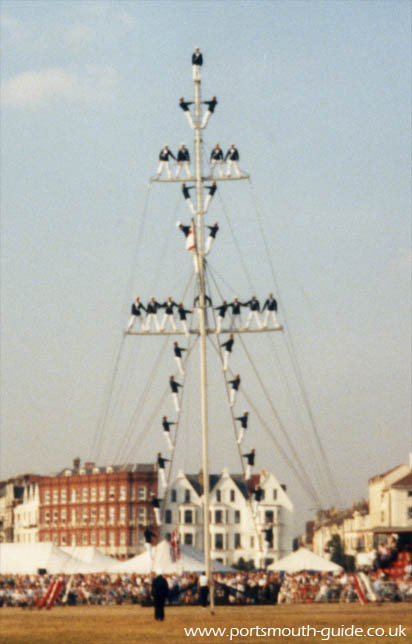 The Mast Manning Display Team was later disbanded. The Mast Manning used to be when sailors climbed the rigging to fix the sails on ships but then it became a display when sailors climbed a mast on shore to music. This was a site to see, as can be seen from the photo above, the mast is tall and one sailor gets to be the button boy on the very top. That year Portsmouth was lucky enough to host the mast manning team many times at different events in the city. 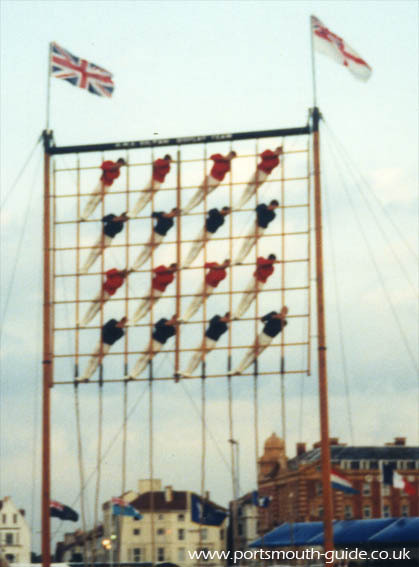 Another display performed by the Royal Navy sailors is the Window Ladder display which luckily still exists. The Window Ladder is when the sailors climb up the ropes and perform their display to music on the lattice work in the air. Part of the display is assembling and dismantling the frame work. Portsmouth was lucky enough to have it a few times in 1995. The above photo was taken at the Forgotten Fleet commemorations that year.